We sell Natures Plus products like Animal Parade® Calcium Sugar Free - 90 animals online in the UK and directly from our award-winning store in Scotland. 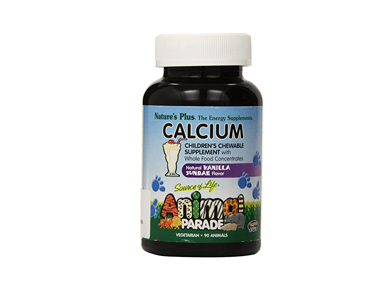 If you want to automatically receive an email when 'Animal Parade® Calcium' is back in stock, just leave your email address below. Nature's Plus Animal Parade® Calcium Children's Chewable Multi - Vanilla Sundae Flavour. Builds Healthy Bodies and Healthy Smiles. For more than 20 years, the name Animal Parade has stood for the ultimate in children's nutritional supplements, with cutting-edge natural nutrition and the award-winning, delicious flavours and varieties that kids love! Now, for parents who wish to limit their children's intake of sugar, Nature's Plus is proud to offer a new choice: Animal Parade SUGAR FREE, sweetened with tooth-friendly xylitol! As official Natures Plus stockist, we sell genuine Children's Vitamins directly from our shop in Scotland and online throughout the UK. Where can you buy real Animal Parade® Calcium safely online? If you are wondering where you can buy Animal Parade® Calcium Sugar Free - 90 animals safely online in the UK, then shop with us. We are an actual health foods shop; with real people selling real foods and products. Our award-winning independent shop is located in Stirling, Scotland since 1976. You can buy our Natural Vitamins and Nutritional Supplements and other genuine Children's Vitamins in store or safely place an order with us online or over the phone. Animal Parade® Calcium - Animal Parade® Calcium Sugar Free - 90 animals in Children's Vitamins and Vitamins and Minerals.